On Sunday 2nd December 2018, Taree Motorcycle Club held Practice in the morning followed by its 2018 Presentation and Christmas Party in the afternoon at the Old Bar Roadside circuit. 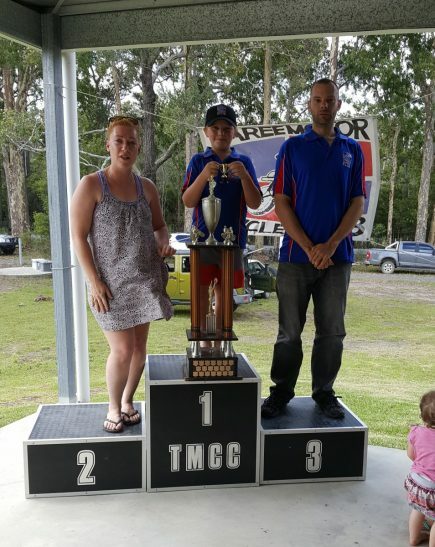 While the Practice and Christmas Party were enjoyed by all those present at the track on Sunday, the formal part of the day was the Presentation of the 2018 Taree Motorcycle Club Awards. Club President, Troy Baker, supported by Vice-President, Samantha Pauline-Lennon, presented the awards. Taree Motorcycle Club congratulates all award recipients. The work of the Taree Motorcycle Club 2018 Committee – President, Troy Baker; Vice President, Samantha Pauline-Lennon; Secretary, Barry Evans; Treasurer, Jo Wilby; and Committee Members, John Openshaw, Bill Lennon and Ian Bisley – was also recognised at the Presentation. The Club also recognised the contribution of those who had worked in the canteen on race days. Taree Motorcycle Club acknowledges that all members, volunteers, officials, visiting riders, spectators, other interested persons and our sponsors, played an important role in making Taree Motorcycle Club what it was during 2018. The Club thanks Scott Calvin for coming to the track on Sunday to take photographs for the Manning River Times and we also thank the local newspapers – journalists and photographer – for supporting Taree Motorcycle Club throughout this year. While the day on Sunday was the culmination of the official 2018 program for the Club, the attention is now focussed on preparations for the upcoming Twilight meeting on 19th January 2019. Club Champions: Dale Austin, Bailey Lennon, Daniel Evans.